This very short tutorial will show you how to make electrical sparks with a spawner and a couple of FX. ; like gravity and wind. 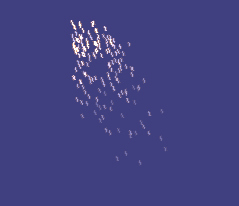 See the comments in the config above to see what part each FX plays on the particles. Just a quick mouse click handler to create a “Sparks” object on the screen. That will make the demo more fun to play with. All done. Click away and cause lots of electrical shorts.